inverted Vees for 80 and 160. 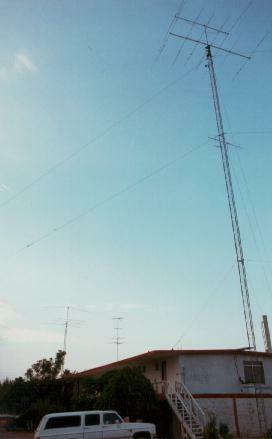 The antenna work was done during the summer and the temperature was frequently above 100 degrees. We, of course, were all dreaming of the heat generated by our big pileups! The small antenna in between the two towers is Noe's TV antenna. Fortunately, Noe and his family aren't into television, at least on contest weekends. The wonderful hospitality we have enjoyed from Noe and his family certainly reaffirms your faith in the spirit of ham radio.